Ballad of the Back Porch - Family Times is an award-winning magazine with staff-written news, feature stories and artwork that inform and inspire Central New York parents and their children. When looking at a new home, most people focus on the kitchen. On HGTV, couples ooh and aah over granite countertops and stainless steel appliances. Not us. My family would never make the cut for an HGTV show because we’re all about the back porch. I know we’re impractical. You can count on one hand the warm-weather months in Central New York. Light, temperature and atmospheric changes make being outdoors risky. Yet spaces wide open to the elements invite romance and magic more readily than indoor spaces. The transitional area where restless nature pushes into tame human habitats is dynamic and unpredictable. And that’s where you’ll find us roosting every May through September. The screened back porch becomes my husband’s home office. I go out there for morning coffee and inspiration for my various writing projects. 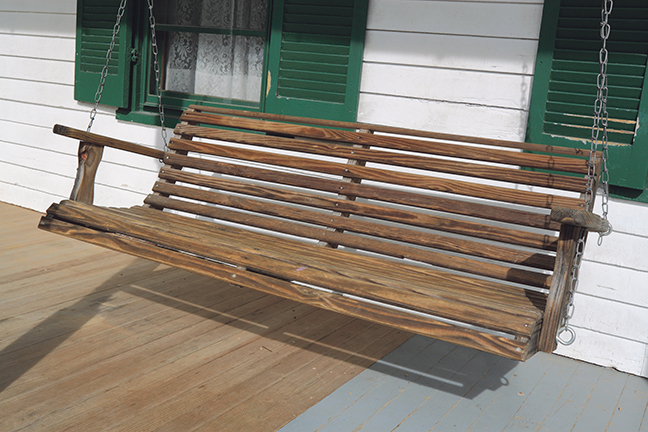 The girls like napping on the wrought-iron settee or rocking on the porch swing. It’s one room we don’t mind sharing and don’t fuss over. Dana was right. They became so cumbersome my husband built the pergola to contain them. They’ve since exploded into a canopy of shifting green leaves, filtering sunlight and giving us tiny grapes too sour for eating but still tempting to try. Those vines are tough. Dana’s three boys and my two girls used to trample them under foot, but they’ve survived. Dana wasn’t so fortunate. We lost her to pancreatic cancer 10 years ago. On the back porch there’s one floorboard that’s a little warped and a little stained. Our dog Dusty used to lie there her last summer, underneath the settee where my husband worked for hours with his laptop on his knees. Those final months her back legs failed and incontinence was a problem, so she lived out there and we kept her as comfortable as we could. We knew that when the cold weather moved in, we’d have to put her to sleep. We have photos of my now college-age daughters as little girls, sitting on the floor with Dusty, petting her, cuddling her and stroking her head. The back porch is hidden enough to make it feel private. It’s witnessed confessions and tears, laughter and embarrassed admissions of things we could have done better. We may lie in bedrooms, air our dirty laundry in the basement and sugar coat in the kitchen, but the truth seems to win out on the back porch, even when it’s hard and it hurts. The back porch is a refuge, a place to be alone and a place to come together. On nights that it’s too hot to sleep, if you wander downstairs and step out there you’ll probably see someone else awake, sitting in the darkness trying to catch a stray breeze. The wrought-iron outdoor furniture my mother found at a yard sale in Utica lives here. I used to sew new covers for the pillows every three or four years; now I just throw a flat sheet over them, tuck the edges in, and it’s good enough. Two director’s chairs that sat on either side of a glass-topped table relocated to the front porch of a house in Chicago; my older daughter lived there with friends during her sophomore year of college. Last year, a free-form hanging sculpture made of garbage bags, coat hangers, cable ties and LED string lights took up residence. A design project my younger daughter created during her freshman year at art school, it suits the back porch. At night we plug it in and it looks like an undersea creature floating above our homey collection of cast-offs. Objects come and objects go. So do people. The back porch welcomes them all. No judgment, just acceptance. Martha Stewart will never feature our back porch in her magazine. You’ll never see it in Design*Sponge or any decorating blog that celebrates home-grown design. But someday when the kids are grown and we put our house on the market, long after granite and stainless steel go the way of harvest gold and avocado green, that back porch will still be a selling feature. And just like last time, the porch swing goes with us. Linda Lowen writes for MSN.com, teaches at the Downtown Writer’s Center and is co-producer and co-host of Take Care, a health and wellness radio show on WRVO. She lives in Syracuse with her husband and two daughters.